We attempted to go to Seven Roses, a polish deli, for breakfast, but their website is out of date and we arrived to find breakfast did not start at 9am, but 11am. We walked up the street to the only other restaurant in the area, Red Chimney, a diner that is firmly rooted in the 70’s, both in décor and prices. 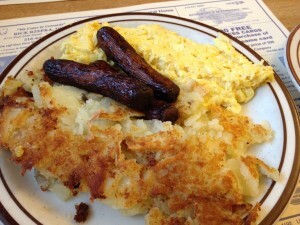 I had the Red Chimney breakfast special: 2 eggs, homefries, 3 sausage links, and toast, all for $3! 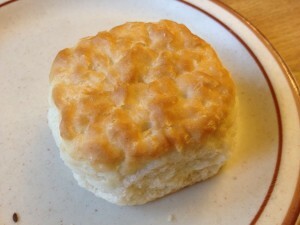 I also got a biscuit (75 cents). 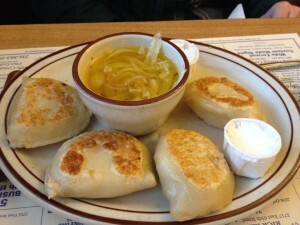 Dr. Marc went for potato pierogies, it came with chicken orzo soup, rye bread and buttered onions. My breakfast was perfunctory. Dr. Marc’s pierogies were doughy and tough, but the buttered onions were great, mixed in with my homefries.